Fetal and Neonatal Secrets by Drs. 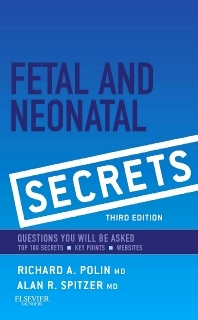 Richard Polin and Alan Spitzer, uses the success formula of the highly popular Secrets Series to offer fast answers to the most essential clinical questions in fetal and neonatal medicine. With its user-friendly Q&A format, practical tips from neonatologists and fetal medicine experts, and "Key Points" boxes, this portable and easy-to-read medical reference book provides rapid access to the practical knowledge you need to succeed both in practice and on board and recertification exams. Review essential material efficiently with the "Top 100 Secrets in Fetal and Neonatal Medicine" – perfect for last-minute study or self-assessment.